The Sazerac dates to New Orleans of the 1850’s and is a variation of an old-fashioned cocktail (spirit, sugar, water and bitters). It is named for the Sazerac de Forge et Fils brand of cognac that was its original prime ingredient. The defining feature of the Sazerac is the method of preparation using 2 rocks glasses rather than a mixing glass and its traditional method of service with both glasses. Made properly this is one of the finest cocktails on the planet. the cocktail and what is in it. Around 1850, Sewell T. Taylor sold his bar, The Merchants Exchange Coffee House to Aaron Bird and went into the imported liquor business. He began to import a brand of cognac named Sazerac-de-Forge et Fils. Bird changed the name of the bar to the Sazerac House and began serving the “Sazerac Cocktail,” made with Taylor’s Sazerac cognac and, legend has it, the bitters being made down the street by a local druggist, Antoine Peychaud. The Sazerac House changed hands several times and around 1870 Thomas Handy took over as proprietor. It was around this time the primary ingredient changed from cognac to rye whiskey due to the phylloxera epidemic in Europe that devastated France’s wine grape crops. The price of cognac was becoming astronomical and the Sazerac de Forge brand failed. At some point before his death in 1889, Handy recorded the recipe for cocktail and the drink made its first printed appearance in William T. “Cocktail Bill” Boothby’s 1908 edition of his “The World’s Drinks and How to Mix Them,” though this recipe calls for Selner Bitters, not Peychaud’s. The drink is a simple variation on a cocktail and could have been ordered in any latter 19th Century bar in the U.S. as a rye Cocktail with a dash of absinthe. It was this type of variation to the cocktail that caused patrons not interested in the new complexities of cocktails to request their drinks done the “Old Fashioned” way. 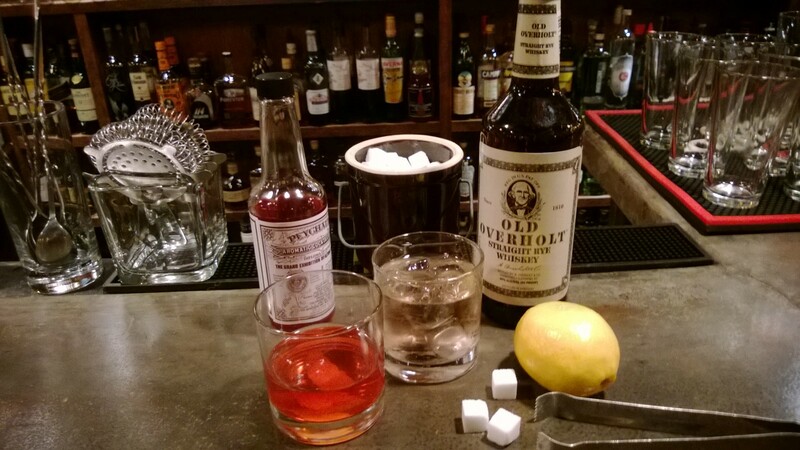 By the early 20th Century, vermouth was fairly prevalent in most cocktails and simple cocktails like the Sazerac had become a somewhat rare curiosity, which aided its popularity. Fill one rocks glass with ice. (If you want to be truly authentic, don’t add water to the ice, but for efficiency feel free to, we do.) Put sugar cube, dash of water and Peychaud’s in a second rocks glass. Muddle the sugar, bitters and water into a syrup and add whiskey. Fill the whiskey-bitters-sugar glass with ice (either from your first glass or if you added water to that one, use fresh ice). The first glass (emptied and now chilled) gets rinsed with absinthe – discarding any excess. Strain the whiskey, sugar and bitters into the chilled-absinthe rinsed glass, rub the rim of the glass with the lemon twist, dropping it in the drink. Fill the glass that you just strained the whiskey-sugar-bitters mix out of with water and serve as a back. It should have a pleasant and faint hint of the cocktail itself. In the 1850’s New Orleans ice was expensive. It wasn’t until 1877 German scientist Carl Linde developed the first commercially viable mechanical ice machine, an ammonia compression refrigeration system. The system spread rapidly in the United States, starting in 1881, interestingly first to breweries, and then to manufacturers who erected mechanical ice plants. You had to buy your ice from the Ice-men at up to $1.50/100 lbs. It seems that some enterprising bartender at the Sazerac house at some point realized that they could save money (or not charge for ice water) by reusing the ice from the cocktail they had just made and making an elaborate ritual out of an otherwise potentially unremarkable drink. Once the patron had the cocktail in hand, they would realize that the drink was anything but unremarkable.